I met my parents at the age of nine after a long absence of almost seven years which covered my childhood, during which I lived surrounded by my grandparents, uncle, aunts and occasionally my sister. 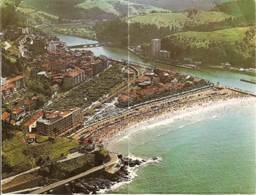 During those years I lived in Las Arenas, Getxo (Basque Country), my mother’s town. I went to the same school as she and I had the same teacher she once had. I performed in several roles at the children’s theater as she did during her teenage years. Every week I visited my paternal grandmother who lived in the nearby town of Algorta. Living in Las Arenas during those years I was participating a little bit in the life my parents lived until the Spanish Civil War broke out. This event separated them almost instantly from everything they loved so much, and it was remembered by them every day of their life in exile. One day I too left everything that was so familiar to me in this tiny part of Europe to go to meet my parents and younger siblings who had been born in South America. I departed alone, on a ship called Monte Amboto. I crossed the Cantabrian Sea and the Atlantic Ocean, and a month later I arrived in Montevideo, Uruguay. From then on I shared my parents’ exiled life with them, living in Montevideo and Caracas, Venezuela, during the years of my youth. My father lived 32 years in exile dreaming constantly of his return. His exiled life was always marked by the pain of being so far from his native land; and since physical return was prohibited to him he transferred himself spiritually to his country by means of the pen. By writing he reflected his feelings about each of the different circumstances he was living with his nostalgia, his pain, and his love for what he had left behind. By the spoken word he captured his audience with an energy and conviction possible only for a soul that felt it as much as he did. And with his exceptional talent he could express himself in an almost perfect way. My father was a very affectionate person. He loved his children and he always found the time for us, guiding or teaching us in anything we needed. He was an optimist, a dreamer and he had a quick temper. He was a person charged with strong emotions even though he calmed down quickly. He was generous and understanding to a point. He had a very simple heart, and he loved nature and the enchantment that surrounded him in the trees, mountains and rivers. He loved beauty in everything. He had an insatiable longing for culture. He was a fervent Catholic but not to extremes. He used examples from the Bible to teach us lessons for our daily life. He loved to have my mother and all of us together for the main meal of the day, generally the lunch hour. That time was a special time for all of us because he made it that way. He used to discuss the subject of the day or the topic that bothered us at that moment. His most outstanding virtue was loyalty, to his family, his Church, his country and his friends. A person from his home town of Algorta wrote about him in 1998: “Vicente de Amezaga was an outstanding speaker. The fluidity and warmth of his words, the scenic mastery over the audience and his notable erudition all came together in his person that it would be difficult for a person who heard him to forget his human warmth, conviction and the lucidity of his spoken message. “In the second place he was a devout enthusiast of linguistic studies. Not knowing the Basque language in his youth, he became a scholar of that language. He became a polyglot. He mastered eight languages. My mother had a completely different character. She had the gift of a serene and patient personality, the still water to the restless spirit of my father. She was his loyal companion, his help, his consolation and his strength. They had the good luck to have each other. The constant absence of their second daughter, Begoña, was for my parents one of the worst parts of their lives in exile. Born in Paris, I lived in France and the Basque Country in my childhood. I spent my teenage years in Uruguay and part of my young adulthood in Venezuela. And I have lived my married life in the U.S., married to an American. I left a bit of myself wherever I lived, and I took a bit of every place with me wherever I went. In war not all the wounded are on the battlefield. There are other wounded, those who suffer emotional wounds that last more than one generation. This is the story of one of them. My father lived most of his adult life in exile. Exile is an invisible disadvantage. Exiles have the same level of knowledge as other citizens, many times more, sharpened by their intensely aggressive development, by the need to make their way, and by adapting to the new environment that surrounds them, which makes their effort and work doubly difficult. One of the many disadvantages of the exile is frustration because he/she can’t communicate in a new world that does not understand his/her experiences. The life of the exile is one of continuous living in an adopted environment which produces a sense of loneliness and isolation that will remain forever. My father talks about this in his writing “Soledad” when he says: “It looks like I live in a desert, and more than alive I believe I am already dead; a dead person who dreams that he is alive.” Using different methods, the exile tries uselessly to build a bridge over that breach that has formed between him/her and the world that surrounds him/her. One of these methods is competing in that culture, most of the time sacrificing communication that makes the goal unattainable and limits his opportunities to improve. Even though the world of the exile offers a unique opportunity to compete, many times he/she does it against others who have the same impotence, meaning other exiles without the obstacle of communication to overcome as when he/she competes with natives. Then the stigma of communication is reduced to a minimum. At the same time there exists a sense of unity, of belonging and friendship and love higher than in the rest of the citizenry. In “Siempre Contigo,” my father speaks of a black and bitter sea, of one long expatriation with the searing absence of his two little daughters, but he has not become desperate because he has his sweet wife with him. Perhaps this sense would not exist at that level if the exile were not so vulnerable. Sometimes exiles develop their highest capacity because of the higher level of competition. History has given us examples of people who have left their countries for one reason or another and who, upon arriving in their adopted country, distinguish themselves in an absolute way. Vladimir Zworykin, born in Russia, invented the television in the United States. Albert Einstein, the German physicist, was the author of the theory of relativity while in exile. In the case of my father, all these frustrations affected the rhythm of his steps and increased the value of his life through an extensive work that he has left to us. The continual sacrifice he made in his life would not have happened if he continued living in Algorta as the Judge of Getxo. The exile who has lived in two worlds – his own and the borrowed – has experienced the double feelings of exaltation and happiness at the same time as the frustrations of each culture in which he has lived, and all that gives him a certain understanding lacked by a person who has lived in only one culture, but at what a price! As it was for most Basques, the lives of the Iribarrens and the Amezagas were stable and relatively unchanging until the terrible decade of the 1930s. Unlike Americans, Basques know where they have been for thousands of years. They are truly one of the ancient and unchanged peoples of Europe. An alleged Basque folk saying asserts: “Before God was God and boulders were boulders, the Basques were already Basques.” It may well be that some Basques say this but nearly all of them think it. 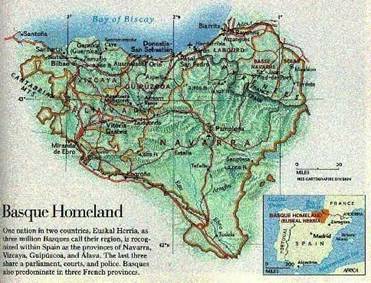 The fact is that no one knows even approximately where Basques came from or how long they have lived in the small crescent of land that curves around the southeastern corner of the Bay of Biscay. We know that there were people living in caves across this region in what is now France and Spain at least 20,000 years ago; the cave paintings left at sites like Lascaux and Santamamiñe (near Guernica) are clear evidence of this. And we have a pretty good idea that people who were the direct ancestors of today’s Basques lived in the region five thousand years ago. What archeologists cannot do (yet) is connect the older population to the more recent one. But maps like this one, of the distribution of the genetic frequency of Rh- blood in Europe, show that the Basques are a genetically distinct population. If somehow it were possible to arrange the world so that everyone lived in ethnically homogeneous communities, each with its own political order, and without any other peoples living alongside them as minorities, the world would have been spared quite a lot of conflict and violence over the last ten millennia. (The world might also have been much less interesting and creative, as well.) But human beings have the notable tendency to want to move from where they are to someplace else, and over the course of one hundred millennia or so we have all become so mixed up and intermingled that nothing short of an act of God would be required to achieve any significant degree of homogeneity. In most instances, political boundaries do not coincide with ethnic, racial or linguistic divisions. Many leaders and many peoples have fought violently to make those lines coincide, nearly always with tragic results. Some peoples have been pursued almost to the point of extinction; the gypsies and the Maya come quickly to mind. But others have resisted assimilation and at great cost have endured and are today living in relative calm. The Basques would fall in this category even though there were moments in the last one hundred years when the outcome of that struggle was in great doubt. How they fared had much to do with the lives of the Amezagas, the Iribarrens, and their children and beyond for generations. The Basque Country, known in the Basque language as Euskadi, is on the coast of the Bay of Biscay, primarily in two autonomous regions – The Basque Country and Navarre --, and in the Pyrenees in southwest France, for a total of seven provinces. 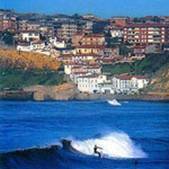 Euskadi is one of the most beautiful places on earth. It is green and grassy, crossed by a chain of mountain streams that coil through steep, narrow valleys in their search for the sea. Despite the decline, the Basques survived as a nation throughout. When they finally did agree to recognize Castilla it was on their own terms, retaining the fueros (ancient privileges) and ancient laws, one of which was that every king upon being crowned should come to Gernika and swear under the sacred oak tree to uphold their laws. Since then, Basques always played an important role in Spanish affairs, far out of proportion to their numbers. They were great sailors and explorers, shipbuilders and whalers, conquistadores and pirates. They organized the first whale fishery; in the Middle Ages Basque sailors helped the English conquer Wales; built the Spanish Armada and founded any number of Spanish colonies including the Philippines and cities like Buenos Aires. The conquistadores Lope de Aguirre and Pedro de Ursúa were Basques; the Basque captain Sebastian Elcano became the first man to sail around the world. Two of Spain’s most important saints, Saint Ignatius of Loyola and Saint Francis Xabier, were also Basques. Loyola was born at his family’s ancestral castle in Guipuzcoa. He was seriously wounded in 1521 at the siege of Pampeluna (now Pamplona). While recovering, he read a book on the lives of the saints, and he was converted and decided to devote himself to a spiritual life. He graduated from the University of Paris in 1528 and later formed the fraternity that came to be called the Society of Jesus (known as the Jesuits). Xabier, who was called the Apostle of the Indies, was born near Pamplona in 1506 and educated at the University Paris. Here he met Loyola and became the first secretary of the Society of Jesus. A man of remarkable energy and organizational ability, he ranks among the greatest missionaries of all times. Vicente Amezaga and Mercedes Iribarren were from the neighboring towns of Algorta and Las Arenas. 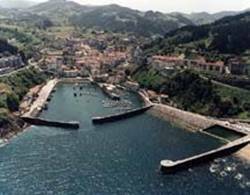 These towns are two of the four (the others are Santa Maria and Neguri) that form the municipality of Guecho, which lies about ten miles from the center of Bilbao. Bilbao, the largest and most industrial city in Vizcaya, and one of the leading cities in Spain, has been in existence since 1300 but its industrial boom dates from the mid-nineteenth century. The city lies along the Nervion River, seen curving through the city in this picture, which shows the city in the 1950s. As the river nears its outlet into the Bay of Biscay, it passes through a number of smaller towns and cities that once had an independent existence but which became suburbs of Bilbao during the 35-year period from 1880 to 1915. 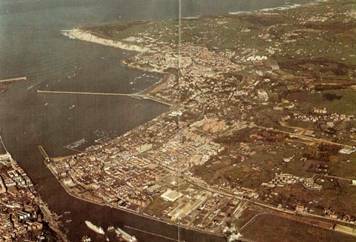 This aerial photograph, taken from a 1960s tourist guide, shows Las Arenas and Algorta together. Las Arenas is in the lower half of the photo, the mass of buildings on the right bank of the river as it flows into the Bay of Biscay. In the center of the photo, the coast line juts abruptly to the left, then to the right, then to the left again, then to the right again, and finally to the left out into the bay. At the first bend to the left, in the center of the photo, is where Las Arenas stops and Algorta begins. Thus the two towns are next-door neighbors and one can easily walk from one town to the other. The picture below, taken from a postcard, shows the town of Algorta as it was in the 1950s. The two pictures below show the original old fishing port of Algorta as it appeared in the 1950s and somewhat more recently. The fishing port of Algorta dates officially from 1626. At one time, the port was capable of receiving up to 17 ocean-going vessels at once. Its strategic location made it a valuable military and naval site as well, and at one time it was guarded by castles, fortifications and even an artillery battery. A light house guided mariners into its port, and wind mills took advantage of its strong winds to power a vital milling industry. Of these most have long since been abandoned and many are nothing more than archeologists’ diggings. The light house still stands but its light has not shone for centuries; the original port is a tourist attraction, nothing more. Today Algorta is home to many tens of thousands of people who work in Bilbao or other neighboring cities at the multitude of jobs one might find in any advanced industrial society in Europe. Las Arenas is a relatively new city whose origins date back only to the middle of the nineteenth century, and for much of its history it has been relatively small, peaceful and rather out of the mainstream of Spanish and Basque history. Until the mid-nineteenth century, Las Arenas had only a small population because of the sand bars that were piled up by the action of the waves coming from off the Atlantic Ocean. In the 1870s and 1880s the population of Las Arenas numbered in the low 100s and by 1930 it had barely passed the 7,000 mark. 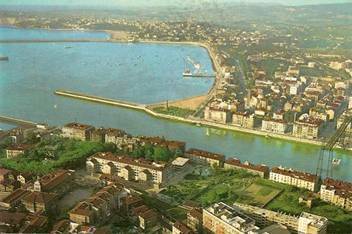 The extensive sand deposits at the mouth of the river made it impossible for ocean-going commercial ships to enter the river except during high tides, thus retarding the industrial and commercial development of Bilbao up river. Beginning in 1880, a number of large and expensive engineering projects were undertaken that resolved the problem of the sand deposits. These projects included a pier and eventually a major port at Las Arenas and a breakwater that extended into the bay to reduce the effects of the waves on the bay floor. In the preceding picture, you can see in the distance the structures that extend out into the water to form a narrow opening through which the vessels pass on their way between Bilbao and the Bay of Biscay. The picture also highlights the most noteworthy engineering structure in Las Arenas, the so-called “hanging bridge” (Puente Colgante) for which the city is famous. The “bridge” is not really a bridge at all but a massive steel scaffolding from which is suspended a shuttle that carries cars, trucks and people back and forth between the right bank, Las Arenas, and the left, Portugalete. Construction of the scaffolding began in 1890 and was completed in 1899. The scaffolding is held up by pillars or towers that are about 150 feet high and anchored by piers sunk more than 30 feet into the sandy soil. When ships pass under the scaffold, passage of the shuttle is halted temporarily. Despite the scaffold’s height, there have been instances when a vessel that passed under the bridge coming into Bilbao fully laden could not pass under when it was leaving empty and riding higher in the water. 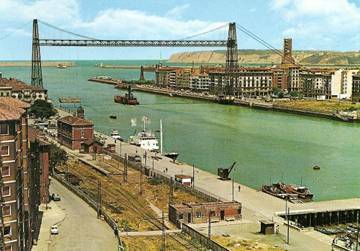 Once the mouth of the river became passable and the two sides of the river connected, the industrial, commercial and professional life of Bilbao expanded quickly into Algorta and Las Arenas. In addition to several roads, a trolley line had been launched in 1876 and this service expanded rapidly until the turn of the century to provide fast and relatively comfortable transportation between Bilbao and the right bank of the river. 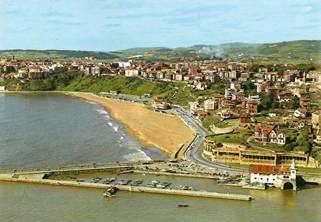 Between 1850 and 1880 Las Arenas had attracted a small number of wealthy families from Bilbao who built summer homes along its attractive beach, and a long promenade, called Paseo Zugatzarte, provided a way for the vacationing families to enjoy the delightful summer evenings. After the trolley and the hanging bridge opened, the area became attractive to many thousands of middle class and working class families who were employed by the numerous factories, shipyards, steel mills, and offices that lined the banks of the Nervion. In the picture below, the hanging bridge is at the lower right and the beach extends roughly north-south through the center. Where the coast turns abruptly to the left marks the end of Las Arenas and the beginning of the town of Algorta. Everything above the river constitutes the larger municipality of Guecho; the town below the river in the picture is Portugalete. At the beginning of Las Arenas’ history as a resort, the chalets (the first was built in 1904) and small palaces there were open only for the summer season. For the rest of the year it was a ghost town, but soon it became filled with suburban apartments. In the next twenty years more than 120 buildings were constructed. It has a unique attraction – the Hanging Bridge – which links the right bank of the Nervion River to the left bank. It was inaugurated on July 28, 1893, and it was the first of its type in the world. Several social and institutional developments were also important to the emergence of Las Arenas as a town in its own right prior to the 1930s. Some of these, like the central market, public schools, municipal government, health care, and sports teams were of little importance to our story. But several turned out to be extremely important. In 1886, the town was granted its first Catholic parish, named Las Mercedes, and its first large church, carrying the same name, was constructed. The Amezagas were married in this church in 1937 under the dramatic circumstances described below. The church was burned during the retreat of Basque nationalists from Bilbao in 1937. A replacement building was begun in 1939 and by 1944 had reached the stage of construction that would permit the holding of Mass regularly. The parish and the church quickly became the center of religious, social, cultural, and community life in Las Arenas. The parish created an association called Accion Catolica (Catholic Action) to attract the youth of the town and direct their energies toward responsible activities. They also created a Casa Social (Social Center) to house these activities, one of which was the presentation of amateur plays with the young men and women of the parish as actors and actresses. And within the parish there was also created in 1905 a school for young girls, the Colegio de la Divina Pastora (literally the School of the Good Shepherdess, later changed to the Colegio de la Madre del Divino Pastor, or Mother of the Good Shepherd). All of these institutions played roles of great significance in the lives of the Iribarrens. Many Basque family names are derived from a place name that has geographic, topographic or botanical significance. The name Iribarren (also spelled Iribaren, Yribarren, and Hiribarren) is derived from the Basque words iri (or hiri) which means “town” or “village” and barren which means the “lowest or most central part of”. Thus, translated more or less literally, the Iribarren were the “people who came from the lowest or most central part of (the bottom of) the town (valley)”. The earliest record (mid-sixteenth century) we have of the Iribarren family name comes from the mountainous valleys of the Pyrenees near the border between France and the Basque province of Navarra. Of these, it appears that the valley of Salazar to the northeast of Pamplona was the most significant. At an altitude of about 3,000 feet, this part of the Pyrenees has for centuries harbored some of the most isolated villages and strategic mountain passes in the region. Salazar is only a few miles from Roncesvalles where Navarrese defenders routed the rearguard of the army of the Frankish Emperor Charlemagne in 778. The church at Roncesvalles is well known as a stopping place for pilgrims traveling along the Way of St. James on their way to Santiago de Compostela since the Middle Ages. 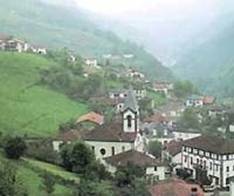 The photo is a contemporary view of the town of Valcarlos in Roncesvalles Pass, near where the famous battle occurred. By the seventeenth century, when the family name begins to appear in neighboring Guipuzcoa Province, it is clear that Iribarrens were leaving the Pyrenees on their way to the more prosperous Basque towns and cities nearer the Cantabrian coast. In 1864, in the Vizcayan coastal town of Motrico (left photo), a boy named Inocencio was born to a local Iribarren family. Near the end of the century, he married a girl named Juliana Gorostegui from the nearby Guipuzcoan coastal village of Deva (right photo). The name Gorostegui (also spelled Gorostegi), comes from the Basque words goros, meaning a species of holly tree or bush known as European Holly, and tegi, meaning “place”. Thus long ago their family came from “a place where European Holly grows”. This family name comes from the town of Bergara, in the western part of Guipuzcoa province, probably about the seventeenth century. These photos of Inocencio and Juliana are from an unknown date, probably taken in Las Arenas. In 1895, shortly after the birth of their first child, a girl named Dolores (called Lola), Inocencio and Juliana moved to Las Arenas, a rapidly growing suburb of Bilbao. Soon after that, Inocencio purchased a parcel of land near the neighboring town of Erandio on the banks of the Nervion River. On this land he built what came to be the industrial firm Talleres Erandio, an enterprise that specialized in constructing cranes and hulls of large commercial ocean-going vessels. Talleres Erandio still exists today and continues to construct the heavy equipment needed for such ships. In this contemporary photo, the red buildings in the foreground are some of the shops of the factory, with some of the heavy lifting cranes seen just behind the shops, next to the river. After their move to Las Arenas, five more children were born to Inocencio and Juliana: the second died in infancy; the four surviving children were a boy, named Inocencio after his father, and three girls – Juliana (or Juli), Maria (or Mari) and the youngest, Mercedes. Mercedes was born in Las Arenas on September 10, 1905. According to the note on the back, the photo on the next page was taken in Las Arenas on the occasion of Mercedes’ seventh birthday. It depicts the five Iribarren siblings, from the left: Mari, Lola, Mercedes, Juli and Inocencio. Each is holding a symbol of their hobby. Lola, an avid reader, is holding a book; Mercedes, a bouquet of flowers; Juli, a fashion magazine; Inocencio, a tennis racket. Mari’s hobby, playing the piano, apparently did not lend itself to this representation. My mother was born in Las Arenas, Vizcaya, a tourist resort village established in 1868. The town featured an endless variety of gardens and beautiful beaches, and wharves where multicolored yachts waited to be sailed into the Bay of Biscay. Las Arenas was created as a luxury residential area for the bourgeoisie who lived seven and a half miles away, in Bilbao. The town is washed by the mouth of the Nervion River along which transatlantic ships navigate the short distance to Bilbao. My mother came from a family of six children. (The second child died during infancy.) My mother was the youngest. Her mother after five long years of suffering died of cancer when my mother was only eleven years old, leaving her widowed father with five kids and two other children of whom he was the foster father and several aunts who took care of the house. My grandfather was a ship’s officer but he quit and opened a business building ships that was very successful. My mother had just finished school and was the administrator of her sister’s business when she met my father. She had a lot of admirers. Her quiet, reserved and calm personality complemented very well the intellectual, restless dreamer who was my father. During the nine years of their courtship they knitted a strong love that would last to the end of their lives. In the years around the turn of the twentieth century, Talleres Erandio did reasonably well and the Iribarren family enjoyed the comfortable life style of the growing middle class of Vizcaya. Mercedes Iribarren was born in the family apartment in this elegant building, and she lived there until she married and left Las Arenas. The photo on the left is from the time when the Iribarrens lived in the apartment; that on the right is contemporary. The Iribarren family embraced the values and programs of Basque nationalism at the time, and Inocencio was told on several occasions that he could not attend Mass wearing the Basque flag on his coat lapel. Both Inocencio and Juliana spoke Euskera as their first language, but class and social pressures of the time dictated that urban families abandon Euskera for the more popular and socially acceptable Spanish, so of the children only Lola learned to speak Euskera with fluency. In 1911, their comfortable life was shattered when Juliana was diagnosed with cancer and, after a long and painful illness, died in 1916. Mercedes was only 11 years old. Inocencio tried to fulfill the role of mother but inevitably most of those responsibilities passed to the eldest child, Lola, who was then 21. 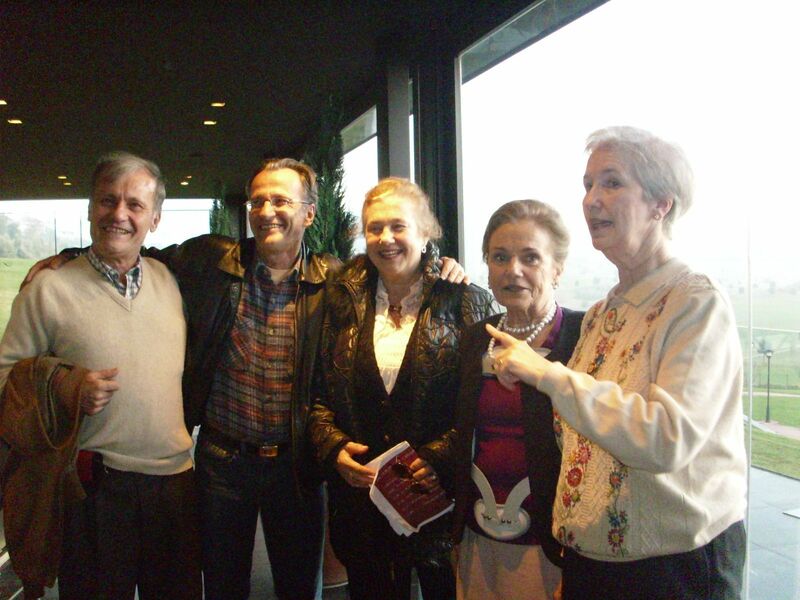 The five Iribarren children loved live theater and they all participated in local Las Arenas theatre groups associated with either the Catholic parish of Las Mercedes or with the meeting hall (called the batzoki) of the Basque Nationalist Party (PNV). The eldest, Lola, directed the productions; Juli sewed the costumes; Mari played the piano; Inocencio handled special effects (one of their favorites was to simulate thunder by dropping bags of potatoes down stairs); and Mercedes, the youngest, acted. She apparently became quite a popular local celebrity, especially with the youth of the town, for her acting ability and delicate good looks and manner. In the photo on the left, Mercedes appears standing on the far left as a member of a cast presenting a play in Las Arenas. (The costumes are of traditional Basque peasant girls.) On the right is a photo of her school, El Colegio de la Divina Pastora, as it appeared during the first half of the century. In 1926, while acting in a play entitled “Cancion de Cuna” (“Cradle Song”) for the local PNV meeting hall, Mercedes caught the eye of a young law student from the neighboring town of Algorta, Vicente Amezaga. Neither of them knew it at the time, of course, but the love that blossomed between them was to bind them together for the rest of their lives, and was to enable them to survive tragedies and obstacles that would have defeated most of us.